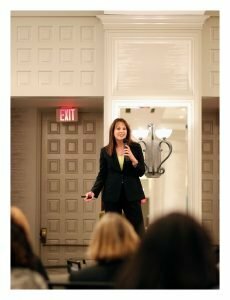 I recently attended the 2018 Evidence-based Teaching and Learning conference, a part of the Lilly conference series on college and university teaching and learning. Each Lilly conference provides an excellent opportunity for faculty to share their scholarly teaching, engage in faculty development, and build a teaching community of peers across all disciplines. A key theme of the conference was engaging learners. Plenary Speaker Professor Elizabeth Barkley spoke on a dynamic framework that can be used to identify strategies and techniques to promote student engagement. Active learning, to help students make connections. Integrate active learning pedagogies such as collaborative learning, problem-based learning, service-learning, and undergraduate research. Transfer, to move students from novice to expert in their learning. 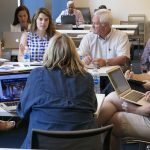 Use active learning techniques to help students encode information from existing knowledge and make meaningful connections in a personalized way, developing pathways to learning. Community, to actively engage students. Promote group work, team-based assignments, round-tables, think-pair-share, small group tutorial sessions, debates, and peer-teaching methods. Use teaching base groups for large classes. 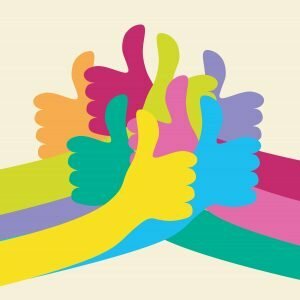 See Choosing the Best Approach for Small Group Work. Holistic learning, to get students’ attention by engaging them across cognitive, affective, psychomotor, and ethical domains. Encourage hands-on experiments, projects, demonstrations, simulation exercises, and presentations. 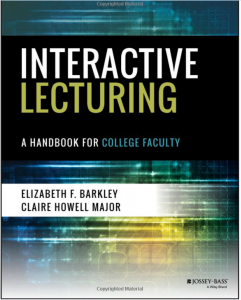 In Barkley’s new book: Interactive Lecturing: A Handbook for College Faculty, she provides tips on creating and delivering engaging lectures as well as concrete techniques to help faculty ensure students are active and fully engaged participants in the learning process. The handbook offers 53 tips on how to deliver engaging presentations, across instructional methods and academic disciplines both for small and large lectures, and for online courses. In “Using the 5 Languages of Appreciation to Strengthen Student Engagement” the presenters applied the language of appreciation and examined techniques that can be used in the classroom to enhance engagement, since appreciation is a powerful motivator for learning. This session focused on the role emotions play in learning and the importance of fostering a sense of belonging. It’s important for faculty to recognize student signals that appreciation is needed. By doing so, faculty focus on the emotional component of learning, as well as the sense of belonging students need to create a climate for learning. Acts of service: help a struggling student with time management, help a student develop study strategies for an upcoming test. Participants brainstormed learner cues that signal appreciation is needed. Instructors can stay attuned to a student’s display of body language, disengagement, defensiveness, social withdrawal, lack of participation, and attitude shifts (cynical, discouraged, resistance and negativity to learning). Know your learners, and consider the many reasons students may not participate in class. To see mindfulness at work in the classroom, check out the video How to Implement Mindfulness in the Classroom. Ah Switch: By using Switch, an instructor can stop the story and give the other listener equal speaking time. Using whole brain teaching helps promote positive values, takes into account the role emotions have in learning (students learn less when under stress), creates participatory spaces, and can be used as a formative assessment tool. Read more about the whole brain teaching techniques we practiced in the session and try a few out in your own class! 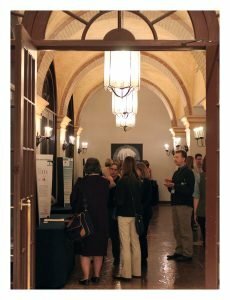 A description of all poster abstracts is included in the conference program. 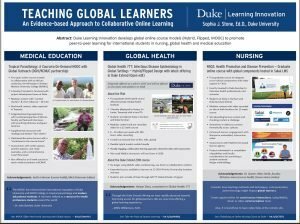 I shared several of Duke’s Learning Innovation projects that focus on global online course models (Hybrid, Flipped, MOOC) to promote peer-to-peer learning for international students in nursing, global health and medical education. Projects showcased included the Tropical Parasitology MOOC, Infectious Disease Epidemiology in Global Settings, and Nursing 502: Health Promotion and Disease Prevention. Projects highlighted were a Learning Innovation team effort, with Justin Johnson, Tara Kramling, Willie Williamson, Heather Valli, Haiyan Zhou, and Nicholas Janes all contributing to the design and development of these global projects! 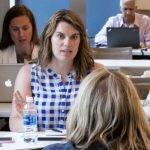 The call for proposals for the Lilly conference in North Carolina “Innovative Strategies to Advance Student Learning” is now open (proposals accepted through April 5, 2018). Lilly conferences are national and international, hosted by the International Teaching and Learning Cooperative.